"We have the ones you're looking for!" For your friend, relative, co-worker, teacher or neighbor. The wonderful gift solution for any occasion. 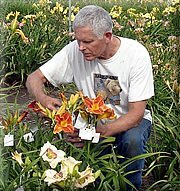 The daylily will grow and multiply over the years, as a reminder of your thoughtfulness. Anniversary, Birthday, Congratulations, Wedding, Christmas, Easter, Mother's Day, Father's Day, Graduation, House-warming, Welcome Home, Thank You, or Sympathy. We will send the Gift Certificate to you the "Giftor," or you can give us their name and address and we will send the Gift Certificate directly to your "Giftee," or recipient. In either case, we will include our new color catalog from which the recipient may make their choice. Fill in the desired dollar amount on the order form, with their name and address if you want us to send it directly to the recipient, and mail it along with payment. Or give us the order by e-mail and either pay with PayPal or send payment through the mail. It's a perfect answer to your gifting decision!